The city police have sent additional forces to the KR Puram to prevent any untoward incident during the last rites of Srinivas. A local BJP leader and husband of a Bruhath Bangalore Mahanagara Palike (BBMP) councilor was hacked to death at a hair saloon at KR Puram here on Wednesday morning. The murder of 41-year-old N Srinivas alia Siripura Srinivas later took a political turn with senior BJP leaders alleging role of local Congress MLA B A Basavaraj, who is considered close to Chief Minister Siddaramaiah. Basavaraj has rubbished the allegation. State BJP president Prahlad Joshi, former CM D V Sadananda Gowda, member of parliament H N Ananth Kumar and others held a protest outside the KR Puram police station. Srinivas was a realtor and his wife Manjula Devi represents the Devasandra ward in the city council. The murder took place at 9.30 am when Srinivas was at the Choice Men’s Saloon on Vasavi Mall road near his residence. He was only with a barber when he was attacked. According to the barber, five persons carrying machetes entered the saloon, hacked Srinivas, and fled. Srinivas received severe injuries on head and neck and was rushed to the Manipal Hospital, where he later succumbed. 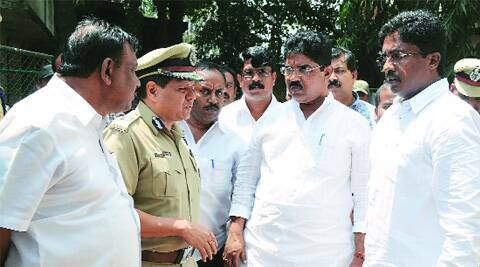 “The assailants came on bikes,” police commissioner Raghavendra Auradkar said. The deceased was planning to celebrate his son’s birthday on Thursday. The police stated that Srinivas’s rivals had made an attempt on his life last year on April 19, but instead killed Vishwanath, one of his associates and a BJP worker. They are investigating whether anyone involved in the earlier attack was linked to the murder as all the accused were on bail. “That time (April, 2013), the real target was Srinivas. The enmity is due to election issues, and all of the accused were following one political leader or the other,’’ the police statement said. “There is an allegation that the conspiracy to murder Srinivas was hatched two-three months ago. There is a CCTV camera on the road and the footage is under examination. Special teams have been formed to arrest the accused,” police said. “He might have been murdered over some property dispute since he was in the real estate business for many years,” said an official attached with the K R Puram police station. Meanwhile, former BJP MLA from KR Puram Nandish Reddy accused local Congress legislator Basavaraj of being involved in the crime. “Basavaraj is behind the murder. There have been many attacks on BJP workers over the past eight months,” Reddy alleged. Basavaraj, however, said Reddy was making allegations to gain political mileage. Former home minister and BJP leader R Ashok alleged that the law and order situation had collapsed in the city. “I have told the police commissioner Auradkar to hand over the case to the Central Crime Branch (CCB) police for investigation,” Ashok said, as he claimed that there had been frequent attacks on BJP workers in the KR Puram region. He said KR Puram ward councilor Veeranna was also attacked by gangs motivated by political rivals recently.